A pasta dish that embodies all the things we love about spring and summer. Fresh, colorful and tied together with a lip smacking lemon cream sauce that is to die for! Featuring the beautiful Q Squared NYC’s Limonata Collection. I’ve been patiently waiting, dreaming of my days in the sun, barbecuing, outdoor parties or pretty much anything that doesn’t involve having the heat on. But despite being almost April, we just recently got a lot of snow! ? But it’s okay, because deep inside I know that soon the sun will be shining and I’ll be able to wear all the dresses (pants are so uncomfortable when you’re pregnant) and throw all the fun spring/summer parties. Ready to go on a moment’s notice, this pasta dish is perfect for impromptu lunch or dinner occasions and can feed a crowd. The peppery arugula and the salty pancetta perfectly complement the real star of the show: the luscious lemon cream sauce. Seriously, I could drink that stuff by the gallon! ? But the truth, my friends, is that even though I was craving a fresh and light spring dish and ready to press pause on all the stews and chilis that were part of my winter diet, this dish was created because I couldn’t wait to use my new Q Squared NYC Limonata Collection. I’ve been in love and deeply obsessed ever since I received this beautiful gift! Isn’t it stunning? What I love the most about Q Squared NYC luxury tableware is that even though it is melamine, it looks and feels like porcelain and ceramic. With a child on the horizon, I am glad that these beautiful plates and serve dishes are virtually unbreakable/shatter-resistant, dishwasher proof and perfect for everyday use. Ideally, I would use those when entertaining by the pool or in the patio. But since we live in an apartment, it will be used for alfresco dinners in the balcony, picnics at our local park and it will probably make regular appearances at our table as well. Q Squared NYC was founded by mother-daughter Nancy and Alaina in 2011, in an effort to inspire others to live elegantly every day. Each original pattern is hand-drawn and they were names “the pioneer for superior quality melamine” by Tableware International! I really don’t say this lightly: I am completely in love with this set. If you’re in love too, Q Squared NYC is giving my readers a 20% discount site-wide plus free shipping on orders over $50. Just use the promo code Olivia20 and go to town! You won’t regret it! 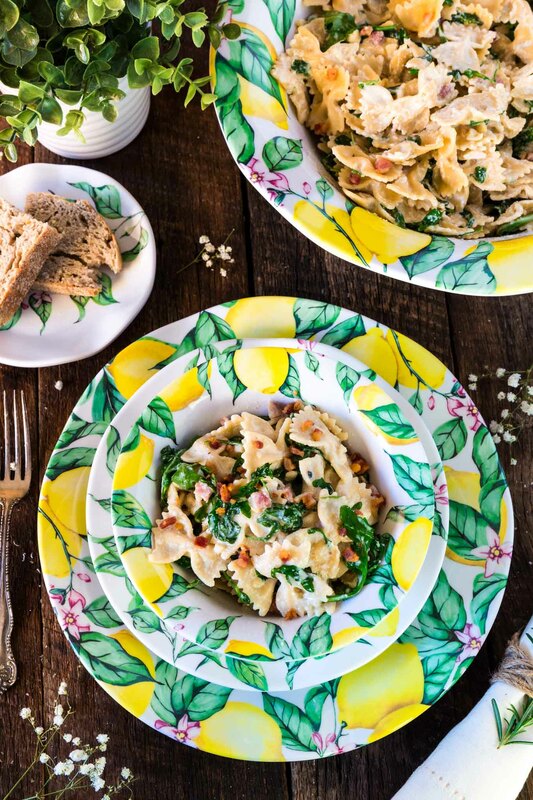 Once you have your beautiful Limonata Collection tableware (or any of their other gorgeous collections), you simply must make a gourmet meal to celebrate. 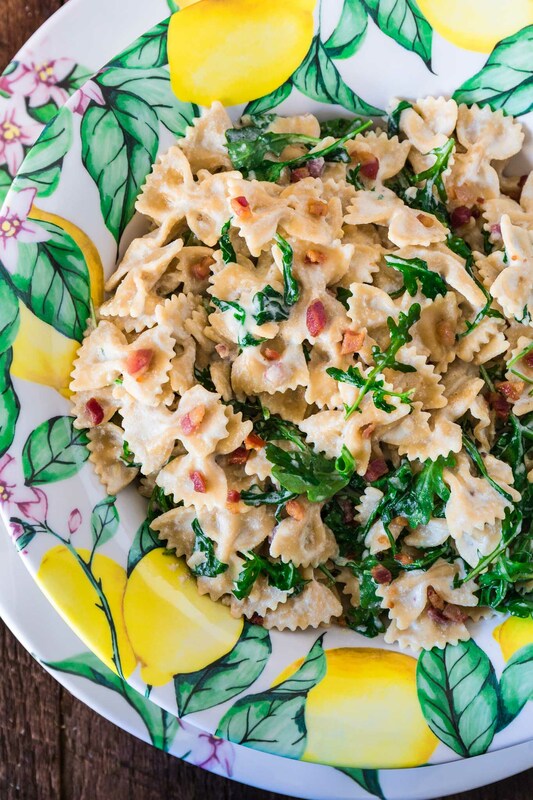 And you really can’t beat this spring-y pasta dish! Serve it with some cold white wine and you’ll be the queen/king of warm weather entertaining. Bring a large pot of salted water to boil over high heat. Add the pasta and cook, stirring occasionally, according to package instructions. Drain pasta and reserve 1 cup of the pasta water. While the pasta cooks, in a large skillet, over medium high heat, saute the pancetta until golden and crisp, about 5-6 minutes. Transfer to a paper towel-lined plate to absorb the excess grease. Remove all but one tablespoon of the pancetta grease from the skillet and lower the heat to medium. Then, add the ricotta, heavy cream, lemon juice and zest, salt and pepper and whisk until smooth. Cook, stirring constantly, until thickened, 8 minutes. Remove from heat and stir in the parmesan cheese. Add the cooked farfalle and arugula to the sauce and toss to incorporate, adding pasta water if necessary. Top with the cooked pancetta and serve. This giveaway has ended and the winner is: Greg Elsass. Q Squared is so awesome that they are giving away a 12-piece melamine dinner set to one lucky winner! To enter, leave a comment below telling me which of their collections would you choose. The giveaway runs until midnight EST on 3/31/2017 and is open to US residents. Wow, I Love the Fontainebleau! So Beautiful! I would love to have a nice set of dinnerwear! I don’t have a nice set, but my kids are older now and I should start looking! I love the Portsmouth! Also – I only use melamine plates – they are more durable, lighter for little hands and older hands. I have never liked or used stoneware or glass! I ❤️ the Captiva set!!! I love the Lima! But they’re all really beautiful. Love all the different choices. I’d most like the diamond square. I’ve been trying to go with a modern decor and these would be perfect. I like the KNOLL GARDENS pattern. I really like the Lima, the colors in the pattern would go with other serving items I have now. I would pick Hampton Toile. Oh my goodness… this is so hard to choose. They have some really pretty dishes and I love them all. I guess it would honestly be between the set you have pictured above… the Limonata or the Heritage pattern. They really are distinctive and I love that they are Melamine. The dish looks so delicious and I will be giving that a try soon. Thanks for sharing. Ruffled in paprika color is awesome and would look great in my kitchen. The captiva set is STUNNING! Reminds me of my beach wedding and my home away from home. This meal sounds absolutely delicious as well. I like the sailing theme on the Portsmouth collection. I like the CAMBRIDGE ROSE IN COBALT. Thank you! Love the Limonata collection! Perfect for outdoor entertaining. I love the Lima collection. So pretty!! I’d pick Ruffle in white — easy to wash, simple and clean pattern, and the square plates make it more updated. I like the Captiva set. I would pick the Classica in Black 12pc Melamine Dinnerware Set. I would choose the Essex Collection. I love the bold geometrics and hints of metallic! I like the Ruffle in linen dishes! I would choose the Captiva. Thanks for the chance!! I love the Tiffany blue color of the Hampton Toile collection! It’s perfect for all seasons! And thanks for the chance at such a cool giveaway! I like the Heritage, there are so many beautiful patterns. I have tile floors always breaking dishes, I need these. I like the Ruffle in Earth Tones. I love the Classica in Black. I like the TILED set the most. I love the CLASSICA IN BLACK 12PC MELAMINE DINNERWARE SET. They are all so pretty. I would choose the Ruffle in Earth Hues. I like the Lima the best. I would choose the Ruffle dinnerware. I would choose the ruffle in pebble variety, because that is the one that most closely resembles the color scheme we have in our dining room. I love the Captiva collection!!!! I love that Heritage pattern. Classic but cute. I love the ocean so Captiva is my choice. I would choose the KNOLL GARDENS 12PC MELAMINE DINNERWARE SET. I love this design. I love so many different styles. I really like the Portsmouth and the Cambridge Rose. I would choose the Bella Donna collection. I really like the Royal Lapis set! I love the Ruffle Signature Collection! Hard to choose only one option, but KNOLL GARDENS is gorgeous!! I’d choose Captiva. I love the starfish. Porto Chale looks perfect for my kitchen! Thanks so much for this chance! I love the Rustic Chic set! It’s gorgeous! I like the Captiva Collection. I would choose the Talavera! I love the Captiva set! They are all lovely, but I would choose Captiva. I love all the collections, but the Captiva has really got my eye!! I like the Portsmouth collection. Makes me think of going on an adventure in eating! I would love to get the Yuletide! My favorites are Pembrook & Essex. Thank you so very kindly for the opportuity! Enjoy your week! I absolutely loveeeeee the talavera!! The Limonata is my favorite. I love the bright colors and it reminds me of Spring with all the lemon blossoms on my lemon tree. I love the Captiva collection! The shells are so pretty. I love the Tiled in blue and green, so bright and pretty!!! I love the CAMBRIDGE ROSE in Cobalt Blue. I like the Classica or Limonata set. I love the Ruffle collections. The earth tones are my favorite. I would love to own Hampton Toile dinnerware. It is beautiful. I love the Palazzo set! That looks great, thank you so much for the chance! The limonita is absolutely fabulous!!!! I love the Captiva ones. I love the Limonata, it makes my mouth water! I would choose the Heritage set, thanks! I’m with you. I would love the colorful and cheerful Limonata set! 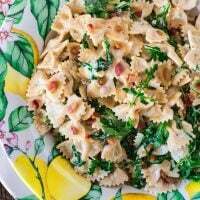 Great lemon pancetta pasta recipe too! I love the CAPTIVA 12PC MELAMINE DINNERWARE SET! Love them all but my favorite is the Fontainebleau 12pc Melamine Dinnerware Set. I like the Cambridge Rose collection! Well, my favorite is the Talavera in Azul, but I think I would go with the Porto Chole because my Mom would love that. She loves anything with roosters on it for the kitchen, & I do love those bright colors. So many to choose from! I think I’d like the Ruffle in Linen or Pebble best. Thanks. I love the Limonata set. I would choose the Captiva pattern! I would choose the Captiva Set! I posted earlier was waiting on moderation, I don’t see my name anywhere, Why? Never mind it still says waiting on moderation, But I couldn’t find it before don’t know how I missed it. Thanks for the chance! I like the Hampton Toile the best. Oh my heart!! I LOVE the Knoll Gardens! I would choose the Diamond Round colelction, it is classic, clean, and chic! Ahh, how perfect is that collection for Spring and Summer!! So pretty! I really also love the TALAVERA IN AZUL! I really love the Ruffle Signature collection. They are beautiful. The rustic chic is the pattern I love. I love the Royal Lapis dinnerware!! So many beautiful choices!! I love the ocean so it would have to be Captiva for me! So many good ones, but I would go with HAMPTON TOILE 12PC MELAMINE DINNERWARE SET. I would choose the Porto Chale collection, beautiful colors! It’s really hard to chose a favorite. I would have to consult with my better half, but I like the Talavera in Roja. The RUFFLE IN PAPRIKA is my favorite. I like the Portsmouth set. I’m a fan of Ruffle. :) Clean and classic…but not boring and bland! I like them all, and would pick Diamond Square. My favorite is the PORTO CHALÉ 12PC MELAMINE DINNERWARE SET, but as I was scrolling through all the wonderful designs, any one of them would be great! Love the ruffle in rich hues! Porto chale is neat. I also like Ruffle in Earth tones. I would choose the Captiva set. I absolutely love the shells and starfish. It is so light and summer looking. 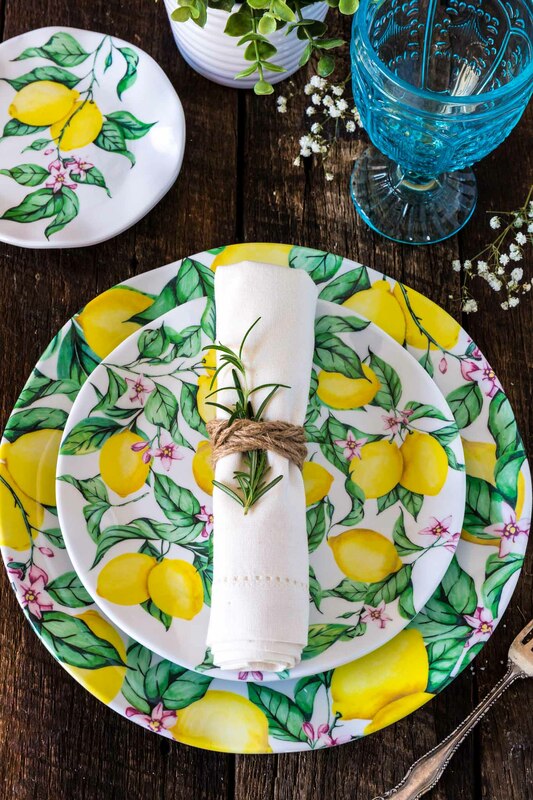 The Limonata Dinnerware set is beautiful. Would love to win! i would choose the limonata collection. it is so nice. i love it. I’d like the Captiva set! I like the Ruffle collection to mix and match. Love the Ruffle dinnerware – very modern and sophisticated looking. I would choose the PORTO CHALÉ — I love Chickens. The recipe looks great, its been added to my April dinner list. I’m partial to roosters and I would love to add the Porto Chale to my kitchen. I love Melamine and Q Squared has so many excellent pieces to chose from. I love the Portsmouth collection, such a neat nautical theme! Cambridge Rose is perfect for my kitchen. Such pretty designs! Your farfalle looks scrumptious, by the way! I would love to have the ROYAL LAPIS set. I would choose the Palazzo set. I would choose the Bella Donna, if I were lucky enough to win. I love the Limonatta shown. It’s so bright and cheery. I really like the Portsmouth. These have come a long way. I love the Lima collection. I finally have a chance to enter, as I saw a couple days ago. How I love love love lemonata! We grow lemons here in Florida..love them..and my grandma was one of the few citrus WOMAN grafters in Florida for years in the citrus industry. Therefore, the pattern is not only darling..its special to me! We also do a lot of al Fresco dining..so this set is gorgeous. Funny about a month ago, when @qSquaredNewYorkCity, introduced the line on Facebook..I hearted and I might have commented too. I also like their captiva line..as that’s where I honeymooned decades ago now..haha. And, have a beachy home full of seashells. I also love the ruffle line. Sorry, I wrote so much. And, why I had to wait to post as I knew I had a lot to say. What can I say..I’m southern! Oh, your pasta dish looks delicious too. I’m going to make it. I would choose the Diamond Square! I love the Essex set. Bella Donna collection is beautiful! I like the Porto Chale collection. Very colorful. I like the DIAMOND SQUARE 12PC MELAMINE DINNERWARE SET and the PORTSMOUTH 12PC MELAMINE DINNERWARE SET. I think that the DIAMOND SQUARE 12PC MELAMINE DINNERWARE SET is cool. I like the PEONY 12PC MELAMINE DINNERWARE SET, DIAMOND SQUARE 12PC MELAMINE DINNERWARE SET, and the PORTSMOUTH 12PC MELAMINE DINNERWARE SET. Our favorite is the Lima Collection ! I love the CAMBRIDGE ROSE IN CRIMSON set!! Thank you for this chance! The recipe sounds amazing!